A convicted serial killer was sentenced to life in prison Thursday for the slayings of three prominent Alexandria residents over the course of a decade as part of a grudge against the city's elite. Charles Severance, 55, of Ashburn was convicted in November of three killings stretching from 2003 to 2014. All three victims were shot in their homes in the middle of a day in a quiet, residential neighborhood, and all three were well known in the community. Nancy Dunning, killed in 2003, was a successful real estate agent and wife of then-Sheriff James Dunning. Ron Kirby, slain in 2013, was a transportation planner often quoted in the media for his expertise on the region's traffic woes. And Ruthanne Lodato, who was killed in 2014, was a well-known music teacher whose brother and father were judges in Alexandria. Prosecutors said Severance, who has a history of mental illness and ran fringe candidacies for political office when he lived in Alexandria, wanted revenge against what he considered Alexandria's enforcement class after losing a child custody case there. Severance's journals were filled with passages glorifying violence and justifying murder as revenge for the loss of his son, Levite. An Alexandria judge denied Severance custody of the child when the boy was a baby, and witnesses testified that Severance seethed for more than a decade. A caretaker at the Lodato home who survived being shot identified Severance at trial as the attacker. 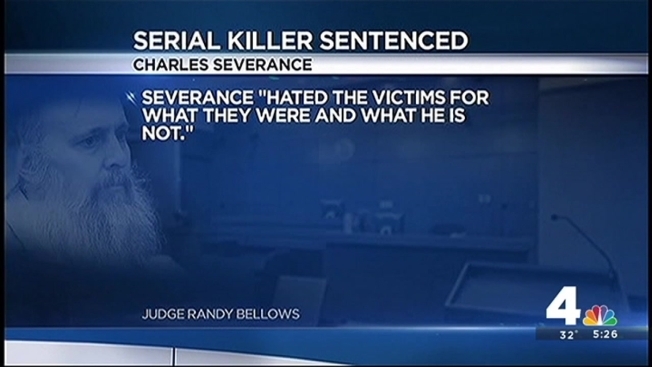 Severance was convicted of capital murder, but prosecutors opted against seeking the death penalty. Under Virginia law, the only option at sentencing was life in prison without possibility of parole. Judge Randy Bellows emphasized the horrific nature of Severance's crimes and ordered that his sentences on 10 different counts be served consecutively. Bellows imposed three consecutive life terms plus 48 years in prison plus a $400,000 fine. Commonwealth's Attorney Bryan Porter explicitly urged the judge to reject that argument. Porter said there's a difference between mental illness and being legally insane, which requires that a defendant not understand the difference between right and wrong. Porter said Severance's careful planning and efforts to avoid getting caught showed that he knew his actions were wrong. A new attorney was appointed to represent Severance on his appeal. Among those in the court gallery Thursday were Attorney General Mark Herring, whose office provided legal support to the local prosecutors, and former Gov. Bob McDonnell, a high-school friend of Lodato's husband. McDonnell is free while his appeal of his corruption conviction is being heard by the U.S. Supreme Court.